Nearly every young boy is obsessed with Star Wars. But for Liam Porter of Augusta, Georgia, a Star Wars obsession may actually be warranted — he’s got a mechanical limb like many of the characters in the galaxy far, far away. The 7-year-old was born without his left arm below the elbow, and his family has struggled for years to find a prosthetic that he could be proud of and is able to use with ease. On Saturday, his life changed when Liam was greeted at his local movie theater by people wearing Star Wars costumes and given the best gift he could ever dream up: a functional new prosthetic arm like that of Luke Sykwalker himself. The prosthetic was made using 3D printing technology, according to the Augusta Chronicle, the newspaper that first reported the story. Liam’s prosthetic is the brainchild of John Peterson, who recently acquired a 3D printer and was searching around the web for nifty projects he could do with it to occupy his time. Peterson happened upon e-NABLE, an online community of 3D-printing geeks who volunteer their technology — and time — to make prosthetics for people in need, especially kids. Volunteers from the organization work with professional designers and engineers, and open-source schematics for free to anyone who wants them. Using 3D technology has strong advantages in this case. Many insurance companies do not cover costly prostheses for children because they will quickly outgrow them. While a standard prosthetic hand for child may cost upward of $9,000, a 3D printed version can be made for just a fraction of that amount. It took Peterson about three months to make Liam’s new limb at a cost of about $300. 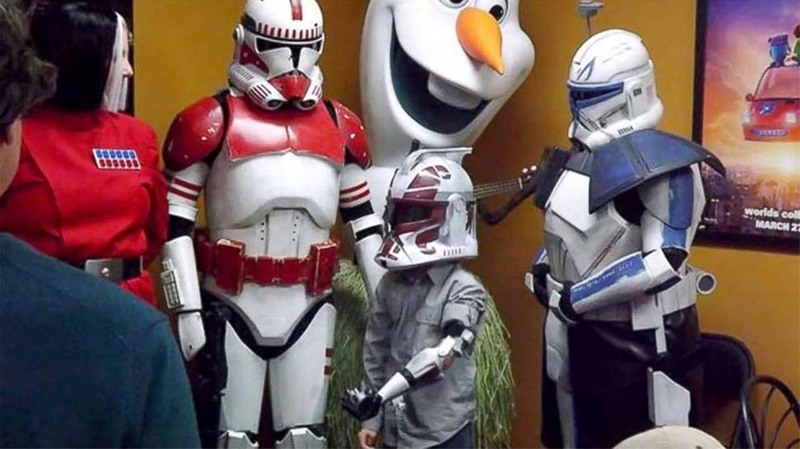 Along with the his new arm, the local group of costumed Star Wars enthusiasts presented Liam with a helmet and a “Friends of the Garrison” 501st Legion certificate, which makes his Stormtrooper appointment official. The Force is certainly proud of Liam.